Vapers using low rather than high nicotine e-cigarettes may be using their devices more intensely, potentially increasing the risk of exposure to toxins in the vapour, according to results of a new LSBU research trial funded by Cancer Research UK and published in academic journal, 'Addiction'. Researchers, based at London South Bank University (LSBU), studied 20 e-cigarette users and found that people using low nicotine e-liquid in their devices puffed more deeply and more often than those using high nicotine liquid. Those using low nicotine also increased the power of their vaping devices when possible. Despite this ‘compensatory’ behaviour, the low nicotine vapers were unable to get as much nicotine as the high nicotine group. But in their quest to do so their puffing behaviour may have increased their exposure to toxins such as formaldehyde, a chemical formed when the e-cigarette liquid is heated. Vaping more intensely and at higher power raises the temperature inside the device which can cause the glycerine and glycol found in most e-liquids to break down into these chemicals. While this exposure is generally still at far lower levels than with smoking, it should be minimised where possible. The low nicotine group also reported a stronger urge to vape, more acute withdrawal symptoms and were less satisfied after use. 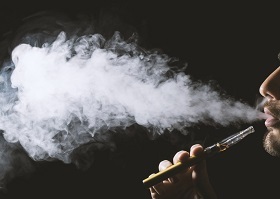 LSBU's Dr Lynne Dawkins, Lead Author of the study, said: “Some vapers might believe that starting out on a low nicotine strength is a good thing, but they should be aware that reducing their nicotine concentration is likely to result in the use of more e-liquid. This obviously comes with a financial cost but also possibly with a health cost. The results of our study suggest that smokers who want to switch to vaping may be better to start with higher, rather than lower, nicotine levels to reduce compensatory behaviour and the amount of e-liquid used. Alison Cox, Director of Prevention at Cancer Research UK, said: “Let’s be clear. While there are potentially harmful chemicals present in the e-cigarette vapour, there are far more in tobacco smoke. The best thing smokers can do for their health is to stop smoking, and switching to e-cigarettes is one way to do this. Read Lynne Dawkins' research report.